Know what classes you want to sign up for? Register online! Registration and Tuition Fees will be due before your dancer's first class starts. Please see our fee schedule below for more information and to become familiar with how we work! Want to do it the paper way?! 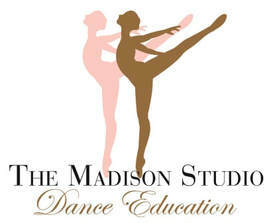 Complete and return to The Madison Studio with the registration and recital fees attached. Forms and registration fee must be submitted before student attends class. Completed forms may be emailed to jmad5699@gmail.com. For our yearly fee schedule and all the fine print. ​New students for the 2019-20 dance year may be accepted from April 1, 2019, through December 1, 2020. Some limited second semester classes may begin January 2020, depending upon demand, and teacher/studio day/time availability. We also offer some classes on a 4-6-week session basis (limited) by Dance Card. An annual $25.00 (per student) registration & the performance fees are due at the time of registration, and students must register before attending his/her first class. Registration is considered complete when a student’s annual registration form and annual registration fee are received along with recital fees. Tuition is based on a yearly fee, and is paid in four (4) installments, due the first class lesson of August, October, January, and April. The four-installment and yearly plan are heavily discounted, and are the preferred form of payment. We accept cash, check, or money order and credit/debit cards through Square. ​When registering please provide and email address where we may contact you--the majority of our communication is through email and our website. PLEASE AGAIN NOTE: We accept checks (payable to MSDE), money orders, or cash. We accept credit and debit payments via Square.